These plates are in the kitchen of our host in Ilakaka, Jean Noel. 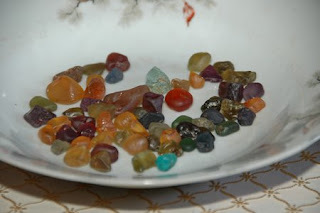 The rough gems you see on the plates actually is a mix of fancy sapphire, spinel, topaz, and garnet…all mined within 50km of Ilakaka. Sadly, most miners have no clue about the relative value of these rocks. When presented to any of the hundreds of Sri Lankan or Thai dealers living in Ilakaka, the offer price is almost always the same…maybe $5.00 per handful. This is part of the legendary “Banc Suisse” mine in Ilakaka. It was originally dug by Jean Noel and about one hundred miners…with shovels only. The mine was named for it’s prolific production in 1999-2004. This is on the other side of Banc Suisse with adopted “brothers” Jean Noel and Jim Fiebig. Jean Noel is a graduate of the IGM Gem-A Gemology program. He used his profits to buy properties in Ilakaka that are rented to Sri Lankan buyers. He continues to support nearly 100 miners and their families that live on his property with rice and tuition for the children. Nancy Schuring and our local guide Alain are entertaining some of the many locals who show up every time we stop our vehicles. They know when we arrive, we always have good things to hand out like toothbrushes, books and food. The children all run up yelling “Vazaha, vazaha,vazaha” Malagasy for “foreigner”. Since most visitors are French, no one can believe we come all the way from America. They love us there. The next two pictures show American Lapidary, Roger Dery and in the final shot with Canadian lapidary, Lisa Elser. 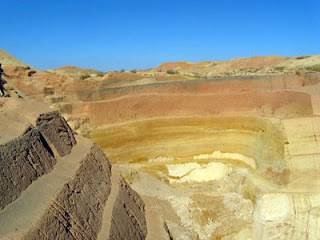 They are being tempted with a trip down the 1 meter by 10 meter hole to find their own rough gemstones. Malagasy people are pretty small and no children ever go down the holes which are really quite stable there.